Malta’s reigning WBU International Light Welterweight Champion ‘Super’ Steve Martin arrived in London on Friday afternoon, within hours he was already sparring at the famous TRAD TKO Gym in Canning Town, where he is basedfor the final preparations for his upcoming title defense, which takes place on the Dave Murphy, Acourtier Events, promoted NIGHT OF CHAMPIONS mega event at York Hall in Bethnal Green, London on Friday 4th October. Steve, who is coached by TRAD TKO coach Barry Smith, won the WBU title, with an against the odds fifth round stoppage victory over Germany’s Sabri Ulas Goecmen back in December. Since then Steve has once again beaten Goecman, in the contracted title rematch, which took place in May this year. This time Steve went one step further, knocking out Goecmen in the second round. In July this year Steve secured a third round TKO over tough Bosnian opponent Adnan Zilic in July. Just one month later, on August 30th Steve scored a sensational second round knockout victory, over another tough Bosnian opponent, Jasmin Vrskic. 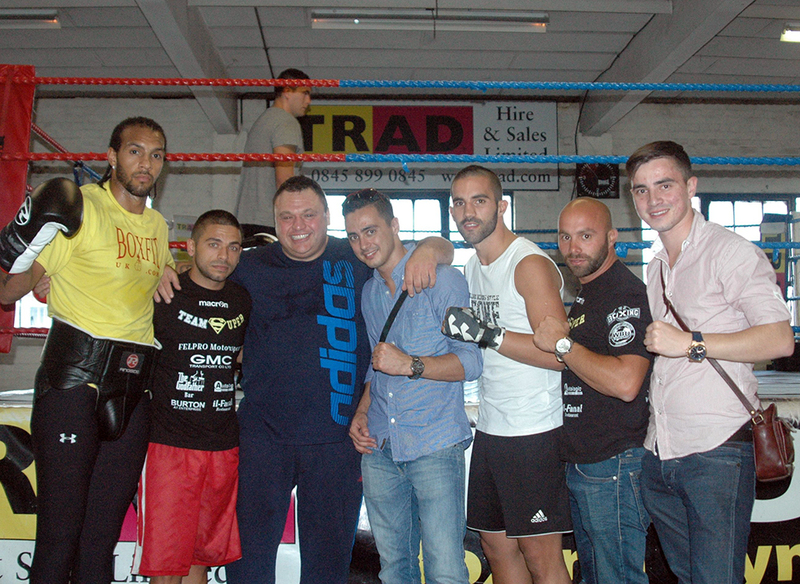 Following the aforementioned sparring session,with Deon Reid and fellow Fight Factory Malta fighter Richard Vella, Steve spoke about his return to British shores and the upcoming fight on October 4th. “It’s good to be back in the UK, I had my first four pro fights in Scotland and my last fight here, just over a year ago, in Sunderland. I was thrown to the wolves in Scotland but scored a good draw in England, this time I will win. Since leaving Scotland, I changed manager and trainer, now I have won my last five fights, all by stoppage wins. This is down to my coach, Barry Smith, taking care of me, he’s given me power and it shows.He’s bought boxing to me, I hadn’t had experience like this before, he’s shown me the way, I have great professional training with him, all my fights I win by stoppage since training with Barry. I’ve improved a lot since my first fights here, I’m fighting my twelfth fight now and this will be the first time I have fought in London. I’m really looking forward to fighting at York Hall and the chance to show the British fans me boxing at my best. I arrived in London a couple of hours ago, I’m just off the plane and already Barry has me here sparring at the TRAD TKO, I love it here, it’s boxing heaven. I’ve been sparring Deon (Reid) and my boy Richard Vella, we spar a lot at the Fight Factory in Malta, I have a few boys I spar in Malta, but Richard came over to help me for my fight here. 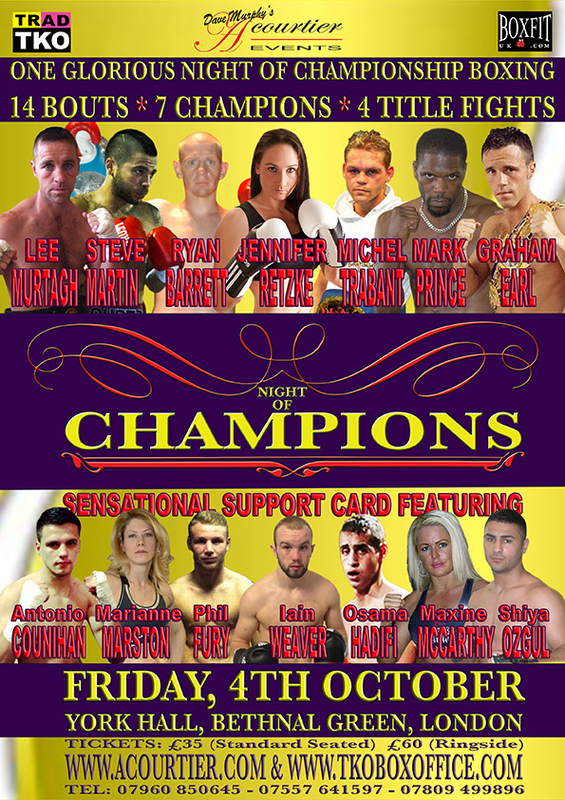 Steve Martin, defending his WBU International title,will be the main support for the Jennifer Retzke versus Angel McKenzie World title clash, that headlines the Dave Murphy Acourtier Events promoted ‘NIGHT OF CHAMPIONS’ event, at York Hall in Bethnal Green, London on Friday, 4thOctober 2013. Tickets, priced £35 (Standard Seated) and £60 (Ringside) are available by calling Steve’s coach Barry Smith on 07407 499714 or on-line at www.acourtier.com - or in person from the TRAD TKO Boxing Gym in Canning town – www.tkoboxinggym.com - For further information call – 07960 850645, 07809 499896 or 07557 641597. Go online to www.Acourtier.com for additional information on the NIGHT OF CHAMPIONS event or the Acourtier stable of boxers. Follow Acourtier Events on Twitter @AcourtierEvents - friend us at www.Facebook.com/AcourtierEvents - and on LinkedIn: www.linkedin.com/company/acourtier-events.